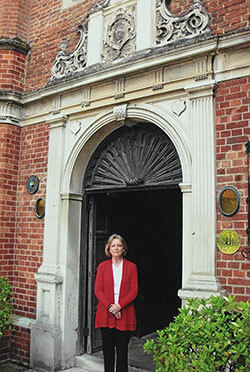 Jane Allen in the doorway of Great Fosters, the 16th-century manor in Egham, Surrey, which was the home of James and Maggie Halkett and is now an A-grade listed building and a luxury hotel. ‘It seemed to Frederick Halkett as if the night would never end. 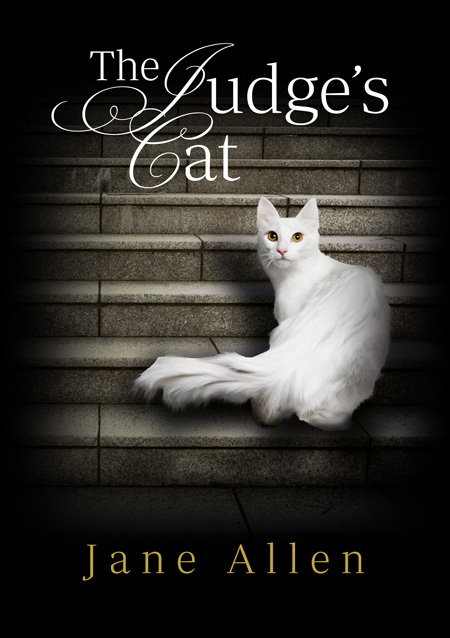 He gripped the rail of the upper deck and stared out into the black, wind-whipped sea. The ship rose up the mountainous swells and shuddered into the troughs, every timber straining. Objects below deck banged together as the vessel was hurled from one gigantic wave to the next. Across the sky the scudding clouds revealed brief glimpses of wheeling stars. They had been at sea for fifteen days. The crossing from Liverpool to New York usually took sixteen days at the most, but there was still no land in sight and the storm had been raging for more than a week. Except for an angry red horizon glimpsed at dawn, the days were as black as night. Food was running low and many of the passengers were weak from sea-sickness. Below decks the air was putrid and even the Captain, who appeared from time to time grim-faced and fatigued, held a handkerchief to his mouth when he ventured down. Frederick was neither sick nor frightened; secretly he was exhilarated by this display of the implacable force of Nature. Born in the year of Napoleon’s ill-fated Russian campaign, he had an engaging manner and at the age of 23 was already a Lieutenant in the Coldstream Guards. In this pitching vessel, the SS United States, he was en route to Canada with Sir Francis Bond Head, engaged to be his aide-de-camp. Also on board were Bond Head’s son Henry, aged 18, and a secretary. It was December 1835 and Bond Head had just been appointed Governor of Upper Canada, charged with the amalgamation of Upper and Lower Canada. A huge wall of water washed over the deck, drenching Frederick’s legs and leaving runnels of foam. He heard a shout, and turned to see Henry sliding across the wet boards, greatcoat flapping, and laughing as he made his way to the rail. ‘How are you holding up?’ Frederick’s answer was torn away by the wind.